As you can tell by now we like to go out to eat… a lot! So, to spice things up we came up with the idea for a special restaurant experience once a month where we would go to a local eatery that we have never been to before. To make things more interesting we have four people to contend with as our friends Frank & Joy are part of this experience. The idea is each month one of the four of us will pick a restaurant we want to go to and that no one in the group has been to before. 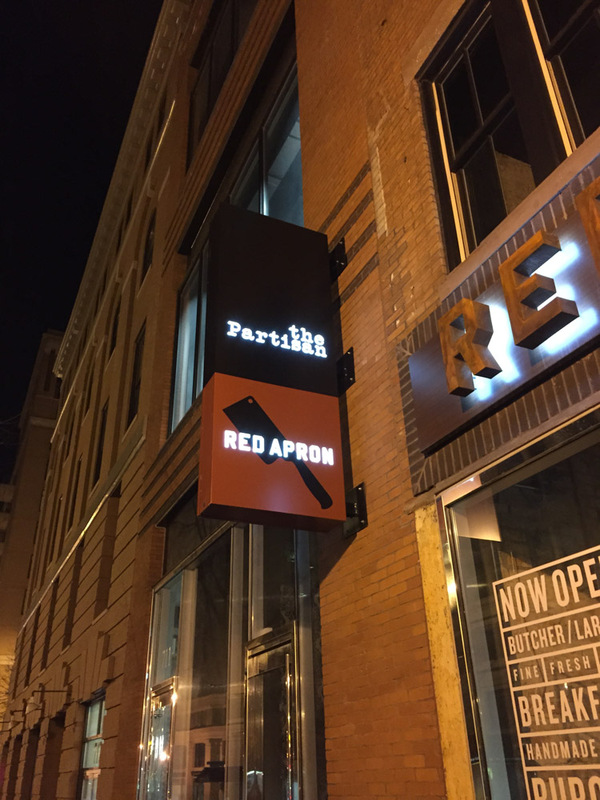 With that said our first “special restaurant” this month was The Partisan in Washington, D.C. Here is a rundown of the fun that was our inaugural event last night. The Partisan is one of the crop of restaurants located in the Penn Quarter neighborhood in Washington, D.C. We arrived at the restaurant a little ahead of our reservations in order to get settled in with a cocktail at their bar. Finding our way to the back of the restaurant we enter a very cool bar scene. The lighting in The Partisan is really well done with lots of indirect lighting, hanging tapestries, and exposed brick. I love the interior of this place… very comfortable… very hip. Waiting for us at the bar we find our friends Frank and Joy! After a round of cocktails and soaking in the bar atmosphere I made my way up to the host stand to let them know we were ready for our table. The host staff was friendly, engaging, and a lot of fun. They told us it would be a few minutes and would come find us at the bar when the table was ready. Frank (being the solid citizen that he is) picked up the tab at the bar and we made our way to the table. The dining room is intimate, dimly lit, and buzzing with energy. Our table was tucked back in a corner which was prime real-estate on this Saturday evening. So far this was turning out to be a great evening. Our waiter Brian came to greet us and give us a run down on the menu. One very cool thing about this restaurant, it is attached to the Red Apron Butchery which is (by their own words) like a candy store for meat lovers. Brian explained to us that to start out with you pick several items off their charcuterie menu like you would off a sushi menu to share with the table. That seemed like the right thing to do, so we dove in and picked several items from the list. Brian knew the wine list and was helpful in picking out a good wine to pair with the Charcuterie board we just ordered. He suggested Lambrusco a red sparkling wine to pair with the meats. The Lambrusco you have probably tasted in the past is very sweet and would not pair with the meats let alone anything else. However, this beautiful wine from northern Italy hit the spot with its well balanced and soft flavor. A perfect way to start the meal. As we were enjoying the wine and waiting for our Charcuterie to arrive someone came to the table for a visit. His name is Mike and he overheard our conversation at the table and then recognized us. As it turns out Mike used to work at Trummer’s and knew Frank and Joy from their many visits to that restaurant. In addition, he read my blog post about our visit to Trummer’s earlier this month and wanted to come by our table to say hello. Mike now works downtown at a restaurant downtown Church Key and encouraged us to come by for a visit. Perhaps this will be in a future blog post. Our Charcuterie board arrived and we enjoyed a sampling of Red Apron’s finest meats. From left to right we had Curried Pork Pate, Andouille Sausage, Spanish Chorizo, Szechuan Peppercorn, Foie Gras and Truffle Bologna, and Pork Liver Terrine. Holy Meat Board Batman… this was soooo good! I feel the need to brace you for the onslaught of food we ordered, sampled, and enjoyed. The food at The Partisan is mostly small plate style which lends itself well to ordering lots of them and sharing with the table. As it turns out we sampled plenty of small plates and snuck in a big plate (or two) for good measure. We needed some good wine to help bridge all of these small plates together. I really like the wine list at The Partisan as it is very Old World focused with a wide selection of amazing wines to choose from. I picked the next wine off the list and went New World with a lovely Pinot Noir from Willamette Valley, OR, Ponzi Tavola. This was a very expressive red with hints cocoa, berries, and spice. Went very well with the varied menu items we were sampling. Brian helped with the final wine choice of the evening a wonderful and earthy Burgundy that had hints of blackberry. This wine paired well with the rich final course. As we prepared to try and say no to the dessert course, Frank and I wanted to sample a little more of their deep Bourbon collection. For our after dinner drink I selected another of Bardstown’s finest Bourbons Noah’s Mill. This is a small batch offering from Kentucky Bourbon Distillers (KBD) which produces Johnny Drum and Willet as well as many other excellent Bourbons. At this point saying we were full and over served would be an understatement. Thank goodness for Uber! The kick off of our special restaurant month was a great success and we will definitely be back to The Partisan! I would like to thank Peter (pictured below) who is the General Manager at The Partisan and a good friend of a co-worker of mine Jake. Peter is a great host and the staff is well trained. This is a very smooth operation that has amazing food! Peter saying goodnight to the gang! If the spoon bends, lick it. A delightful descent into dietary decadence by the bacchanal Bodhisattva! You are the master of alliterations my fine friend!